There is no refuting global warming when comparing lake temperature data from around the world from decades past to the same lakes’ temperature readings of today. The study, published in the Geophysical Research Letters and online in December, 2015, finds the Great Lakes are some of the world’s fastest warming lakes. The decline of Great Lakes ice cover over the past several decades is contributing significantly to the rate of increase of summer water temperature, the study said. Dozens of researchers pooled decades’ worth of data from hundreds of lakes and concluded that the world’s lakes are warming even more rapidly than the oceans or the atmosphere. The warmer waters threaten fish populations, ecosystems and fresh water supplies around the globe. University of Minnesota Duluth Professor Jay Austin says the thick sheets of ice that blanketed Lake Superior for the past two winters did nothing to change the fact that Superior, like the other Great Lakes, is growing ever warmer. “Lake Superior is one of the more rapidly warming lakes” among the 235 lakes in the study, Austin said in a 17 December 2015 Star Tribune report by Jennifer BrooksBy. A two-degree temperature shift can mean the difference between an iced-over Superior or an ice-free lake, he said. “Relatively small changes can lead to large changes in systems that define our region. 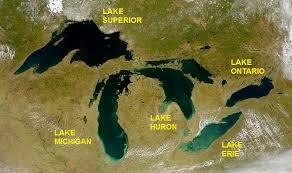 Duluth would be a fundamentally different place if Lake Superior never formed ice”, Austin said. The study, which was funded by NASA and the National Science Foundation, found that lakes have been warming by more than half a degree per decade. That might not sound like much, but when lakes warm up, toxic clouds of algae can bloom, fish habitats can be disrupted and invasive species currently held at bay by Superior’s inhospitable cold might be able to make themselves at home. The lake study is the first of its kind to use both satellite temperature data and long-term ground measurements. More than 60 researchers surveyed more than 200 lakes that hold more than half the planet’s freshwater supply, using data that stretched back at least 25 years. Their findings were announced Wednesday at the American Geophysical Union in Washington, D.C.
“These results suggest that large changes in our lakes are not only unavoidable, but are probably already happening,” the study’s lead author, Catherine O’Reilly, an associate professor of geology at Illinois State University, said in a statement. O’Reilly’s research found that as lakes warm, their productivity declines. The world’s lakes are warming faster than the oceans or the atmosphere, Austin said. Unlike air temperatures, which can fluctuate wildly from day to day or even hourly, lake temperatures are stable, making them ideal systems for measuring climate change. It takes a significant shift to change the temperature of a lake — much as it takes as much energy to heat a pot of water on the stove as it does to heat an entire room. The current rate of lake warming — an average of 0.61 degrees per decade — carries the risk of a 20 percent increase in algae blooms, which deplete oxygen in the water and can be toxic to fish. The lakes seem to be warming faster in northern climates like Minnesota, where lakes are losing their ice cover earlier. In 2007, Austin and his colleagues found that the average summer water temperature on Lake Superior had risen more than 4 degrees since 1979. Meanwhile, Eli Kintisch of the journal Science reported 18 December 2015 that the global survey of hundreds of the Earth’s lakes found that climate change is causing lakes to warm faster than the oceans or the air around them. One reason is that warmer wintertime temperatures are producing less ice atop lakes that normally freeze over. Reduced lake ice coverage, in turn, increases the amount of sunlight lakes absorb. The changes could spell trouble for cold water lake species like trout. It may also have more serious global effects. Higher lake temperatures may speed the conversion of carbon-rich organic matter in lake sediments into methane and carbon dioxide, gases that once released into the atmosphere could exacerbate global warming. At the United Nation’s Twenty-first Intergovernmental Conference of the Parties (COP21) held in Paris, France 30 November to 12 December 2015, the Conference Parties from virtually all the world’s nations agreed to hold global warming below 2 degrees Celsius (3.6 degrees Fahrenheit) and, by 2050, to reduce emissions of heat-trapping greenhouse gases to a level that land and ocean ecosystems can absorb and, thus, keep them out of the atmosphere. These “Planetary Boundaries” were proposed as global guardrails within which humanity can continue to develop and thrive for many more generations. Scientists have estimated planetary boundaries for climate warming, land use, freshwater use, ozone, nutrients (namely nitrogen and phosphorus), and other key characteristics of the earth that determine the quality of our lives and our survival, say Adam Hinterthuer and Steve Carpenter, ecology researchers at the University of Wisconsin’s Center for Limnology, located on the shore of Lake Mendota in Madison, Wisconsin. In a 17 December 2015 Center for Limnology blog post, Hinterthuruer and Carpenter, state that “by crossing these boundaries, we may risk creating large-scale environmental changes that are difficult to reverse and could forever alter life on earth”. Continuing, the authors state that “the warming boundary of 2 C was chosen with ecology in mind. As temperatures rise higher than 2 C, changes in the biosphere, or the living parts of the planet, can accelerate warming. In that scenario, we’ll go from worrying about how Earth’s climate impacts its ecosystems, to worrying about how these changed ecosystems drive even more warming. “In an effort to counter this potential release, Russian scientists are conducting a large-scale experiment to convert the tundra and taiga to grassland. Ecologist Sergey Zimov and his son Nikita are re-establishing large herbivores—elk, bison, moose, horses and reindeer—in a 53-square-mile reserve in Siberia known as Pleistocene Park. The idea is that these animals’ eating habits—grazing—may turn the existing ecosystem into grassland. The hope is that the resulting grassland will insulate the permafrost, stave off melting, and thereby prevent the emission of greenhouse gases as the planet warms. “However, it is not certain whether the big grazers will restore the grassland or if the grassland will prevent permafrost melting. Moreover, if the scheme does work, millions of square miles of taiga and tundra would have to be converted to grassland in the next few decades—a large undertaking to say the least. In their 2009 book The Vanishing Present: Wisconsin’s Changing Lands, Waters, and Wildlife, Donald M. Waller and Thomas P. Rooney cite the work of University of Wisconsin at Madison’s Emeritus Professor John Magnuson, who documented ice cover on lakes around the globe, including Madison’s heavily researched Lake Mendota, and found markedly reduced ice cover from decade to decade during the last century.